CELLFOOD SAM-e (pronounced "Sammy") is the commonly used name for S-Adenosyl-Methionine. SAM-e occurs naturally in every living cell and is a co-factor in a process called methylation that affects more than 100 complex biochemical reactions in the human body. SAM-e helps our bodies make and regulate hormones, cell membranes and the neurotransmitters that affect mood. SAM-e promotes "emotional well-being" as well as "joint health". SAM-e also contributes to the building blocks for cartilage, and is involved in making glutathione, which the liver uses to remove poisons such as alcohol. SAM-e is a "methyl donor", meaning that when it reacts with vitamin B12 and folic acid, it gives away units of carbon (a methyl group) to other molecules in the body. That process is critical in the production of "feel good" brain chemicals like dopamine and serotonin. SAM-e was originally developed by an Italian firm as a pharmaceutical in the early 70's but lacked the resources for a drug approval in the United States. SAM-e has now been the rave for more than 20 years, in 14 over countries. Until now, SAM-e has only been available in a capsule form. Today, NuScience Corp. has been able to engineer SAM-e into a stabilized liquid form, while adding a CELLFOOD solution, creating this unique proprietary "feel good" blend. Cellfood SAM-e and Mood Enhancement: Researchers have identified several possibilities. Normal brain function involves the passage of chemical messengers between cells. CELLFOOD SAM-e may enhance the impact of mood-boosting messengers such as serotonin, norepinephrine, and dopamine - either by regulating their breakdown or by speeding up production of the receptor molecules they latch on to (Serotonin is the neurotransmitter the drugs like Prozac elevate). CELLFOOD SAM-e may also make existing receptors more responsive. These molecules float in the outer membranes of brain cells like swimmers treading water in a pool. If the membranes get thick and glutinous, due to age or other assaults, the receptors lose their ability to move and change in response to chemical signals. By methylating fats called phospholipids, CELLFOOD SAM-e keeps the membranes fluid and the receptors mobile. CELLFOOD SAM-e and arthritis, joint support: Nearly 1/3 of the over 40 million Americans with chronic pain use drugs like aspirin, ibuprofen, and acetaminophen. In arthritis-strength dosages, these nonsteroidal anti-inflammatory drugs (NSAID's) have devastating side effects. Over 100,000 Americans are hospitalized annually from NSAID induced ulcers and more than 16,000 die. In a dozen clinical trails with more than 22,000 patients, researchers found SAM-e as effective as pharmaceutical treatments for pain and inflammation, without any signs of digestive tract damage, sexual dysfunction, dry mouth, or nausea. And instead of speeding the breakdown of cartilage, SAM-e may actually help to restore it. Medical experts from The Arthritis Foundation recently stated that they were satisfied that SAM-e "provides pain relief". Also, SAM-e has shown no signs of drug interaction and can be taken along with most, if not all prescription drugs, under a doctor's supervision. Cellfood SAM-e Liver health - In the liver, CELLFOOD SAM-e supports GSH production and uptake, which is mainly responsible for removing dangerous toxins from the body. Because of the liver's continuous battle against toxins, adequate concentrations of glutathione are crucial to survival. Damage occurs when the liver is so overwhelmed by toxins that it cannot produce enough glutathione. Part of that concentration burden falls to SAM-e, which is a necessary component of glutathione’s creation. Ingredients - CELLFOOD SAM-e is made from all-natural, plant-based organic substances. 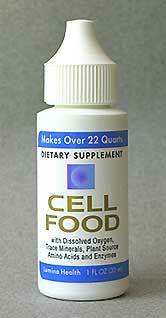 CELLFOOD SAM-e contains no alcohol, glucose, yeast, or gluten. CELLFOOD SAM-e does not contain any ingredients that are on the “list of banned substances” for professional and amateur athletic competitions and associations. CELLFOOD SAM-e is non-addictive, non-invasive, and completely non-toxic. Caution – Individuals diagnosed with a bipolar disorder or serotonin syndrome should consult with their professional health care practitioner prior to using CELLFOOD SAM-e. Suggested Usage: Adults: Take 10 drops directly in mouth and swallow, 2 times per day. Caution: Individuals diagnosed with a bipolar disorder or serotonin syndrome should consult with their professional health care practitioner prior to use.